A tactically important weapon that entered service in December 1943 to provide German armoured forces with a high level of air defence against low-flying attack aircraft, the five-man Flakpanzer IV (2cm) mit PzFgst Panzer IV/3 Wirbelwind (whirlwind) was based on the chassis of the PzKpfw IV Ausf J medium tank. This ensured that the vehicle had mobility equal to the battle tanks then in service, while the design of the armament installation ensured that the gun crew had better protection than had been offered in earlier self-propelled anti-aircraft gun mountings. 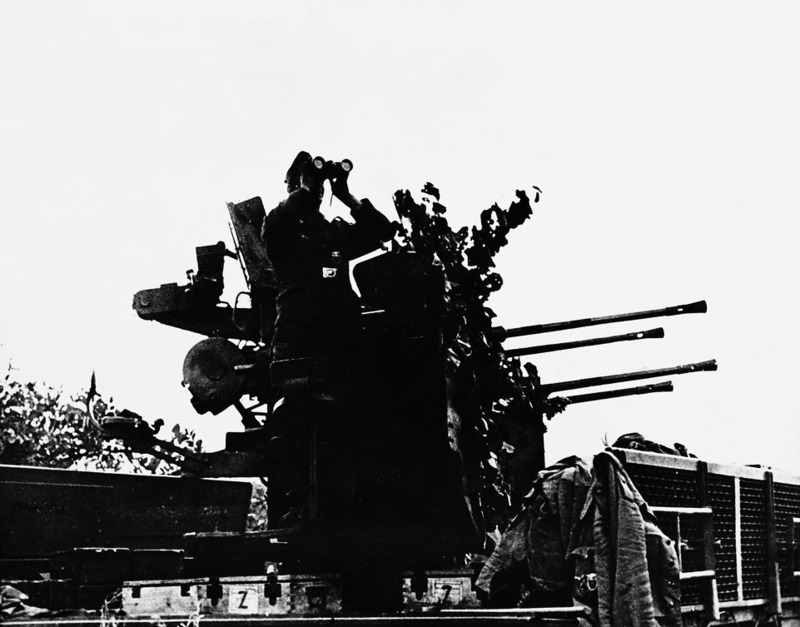 This protection was created by the installation of the 2cm Flakvierling 38 unit, with its four 20mm cannon, inside an eight-sided turret, with outward-angled lower sides and inward-angled upper sides of exactly the same dimensions to facilitate the task of welding together the turret’s 16mm (0.63in) plates. The turret had power traverse through 360°, and the guns could be elevated through an arc between +10° and +90°. Ammunition for the guns was carried in 20-round magazines, stowage being provided for 16 such magazines in the turret for replenishment from some 2280 more rounds carried in 15 boxes inside the hull. The Flakpanzer IV (3.7cm) Ostwind (east wind) was basically similar except for its armament of one 3.7cm Flak 43 gun in a turret whose plates were increased in thickness to 25 mm (1 in).